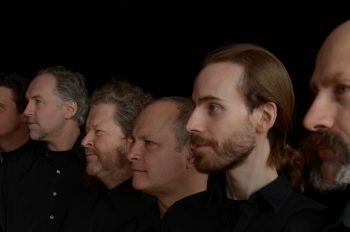 After the dramatic success of the PBO’s production of Messiah in 2017, EMV has invited guest director Ivars Taurins, conductor of the Juno award-winning Tafelmusik Chamber Choir to lead an international team of soloists, the PBO and the Vancouver Cantata Singers in a thrilling period instrument performance of this seasonal favourite. Giovanni Gabrieli, who died in 1612, was without a doubt the greatest composer of the Venetian High Renaissance. We celebrate the holidays this year with music by this Venetian master, his uncle Andrea, and their contemporaries. This is music that would have echoed from the mosaic-covered vaults of Saint Mark’s Basilica as well as other Venetian churches. The program consists of motets for from two to fifteen voices, as well as dazzling sonatas and canzonas for cornetti, trombones and strings – festive music worthy of the season but also of the pomp and brilliance of the Venetian State. “Hwaet!” commands the storyteller. Listen! And tremble at this fearsome tale! A millennium or more has passed since the superhero Beowulf appeared in the annals of epic poetry, yet the legend of his bare-handed conquest of the terrifying Grendel endures. As one of the world’s leading practitioners of historically informed music and theater, Benjamin Bagby dramatizes the awe-inspiring poem in the original Anglo-Saxon, while simultaneously accompanying himself on medieval harp. With English supertitles. Join the musicians and vocal soloists of La Nef and Chor Leoni Men’s Choir as they explore music of the sea with capstand shanties, halyard shanties, laments, forecastle songs, and short haul shanties: hear the rich songs and music that accompany a sailor’s work and play. Inspired by a tradition of English maritime music going back to the 16th, 17th and 18th centuries, Seán Dagher, the troupe’s musical director, has created modern arrangements of these songs to display all the warmth and depth they deserve. 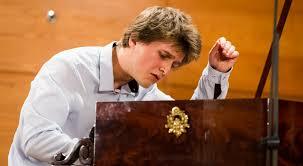 In September, 2018, 23-year-old Tomasz Ritter won the 1st Chopin Competition on Period Instruments in Warsaw. With the introduction of this new branch of the famed competition, the Chopin Institute have sent a clear message about the importance of reviving and understanding the 19th century instruments for which Chopin wrote. Of the thirty pianists from nine countries in the competition, Ritter’s talent unanimously captured the jury’s imagination. A graduate of Moscow’s Pyotr Tchaikovsky Conservatory, Ritter has studied with period pianist luminaries, Johannes Sonnleitner, Alexei Lubimov, Malcolm Bilson, Andreas Staier and Tobias Koch. Join EMV and the Vancouver Chopin Society for the debut of this rising star. To celebrate both the 250th anniversary of Beethoven’s birth, as well as to mark the 50th anniversary of EMV, and the 30th anniversary of the Pacific Baroque Orchestra, this performance is designed to evoke the excitement surrounding the debut of Beethoven’s first symphony on April 2, 1800 in Vienna. This will involve the largest-scale period instrument orchestra ever assembled in Vancouver and will demonstrate the extent to which the regional period instrument scene has grown and flourished on the West Coast in recent years. In addition to Beethoven’s first Symphony, the programme will also Mozart’s Jupiter Symphony and excerpts from Haydn’s Creation with the participation of the Vancouver Bach Choir and the Vancouver Cantata Singers. The Field of the Cloth of Gold represents one of the most spectacular political summit meetings of all time. Henry VIII of England and Francis I of France met to seal a treaty of friendship between their two warring countries, with no expense spared. Everything was carefully prepared to make the surface seem smooth, yet there was an undercurrent of the most intense rivalry, from the negotiations of high state, to the wrestling, the food, the jousting – and the music. The two Chapels Royal were in attendance, and of course they tried to out-sing each other. As luck would have it the two choirs were led by two exceptional composers of the period, to whom the Tallis Scholars have devoted individual recordings: Jean Mouton on the French side, and William Cornysh on the English.